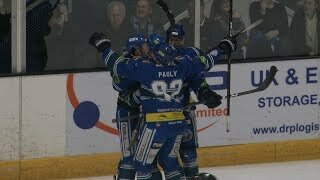 For the second night running, the Genting Casino Coventry Blaze were involved in a special teams battle, this time though coming out on the wrong side of it as Milton Keynes Lightning scored three powerplay goals, whilst Danny Stewart's side were blanked from numerous opportunities in a 4-1 defeat at Planet Ice, MK. The penalty trouble started early for Coventry as an abuse of official call to Ben Lake followed by a further two minutes slashing on Ross Venus saw the home side take a 1-0 lead 5-on-3. Andreas Valdix at the backdoor (2.14) scoring before Robbie Baillargeon scored the first of two to make it 2-0 on the resulting 5-on-4 (3.49). Luke Ferrara got Coventry on the board at 6.43 but a third powerplay goal for MK from Martin Mazanec (14.22) ended the opening twenty minutes 3-1. 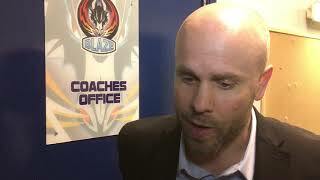 A common theme emerged over the remaining two periods as Blaze let slip over ten minutes of time on the man advantage, with Lightning's goalie Partick Killeen, stopping a total of 39/40 shots in inspired form. As frustration set in and Coventry committed more and more offensively, Eric Neiley who was a stand-out all night broke free, feeding Baillargeon for his second on the night (56.37) and a final score of 4-1.